As the global leader in small business telephony,* we believe that smaller companies should have access to essentially the same features and capabilities that are available to larger enterprises. With our broad range of expertise and experience, The Computer Crew is uniquely positioned to deliver the most advanced systems to small businesses in a cost-effective manner. The Computer Crew Small and Medium Communications Business Solutions help organizations streamline operations, improve remote communications, increase team productivity, reduce costs, and enhance customer service. We also help growing businesses deliver ongoing accessibility and nonstop business operations. ° Thousands of dollars in cost savings. ° Improvements in efficiency and productivity. 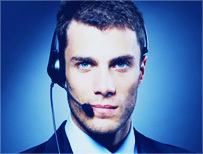 ° Significant enhancements in customer service. Some smaller companies have even reported that their Computer Crew solutions have helped them level the playing field to compete effectively with larger corporations. So whether you have 5, 25, or 250 employees, a single office or multiple locations, The Computer Crew has the right solution to fit your business needs. And because we have relationships with certified partners throughout the world, you can enjoy the benefits of Avaya solutions for small to medium-sized enterprises wherever you are located. Commercial Business Telephones are built from the ground up specifically for small and medium-sized businesses. It’s an award-winning solution that delivers the communications capabilities big businesses are used to, along with the ability to grow from as small as a five-user single site to a 1,000- user multisite organization—all with the same solution.